"Dew distilled from the stars" was the romantic description of honey by the Greek philosophers, who regarded it as the food of the gods, an elixir of youth. In actual fact, the veneration of HONEY can be traced back throughout the course of human history, and its praises have been sung in every era. A natural product of such enormous nutritional value as honey certainly couldn't be ignored by that eternally famished marauder, man. From the very dawn of humanity, we've been well aware that the result of our raids inside hollow trees are well worth a few stings from the outraged bees. The Ancient Egyptians were great lovers of honey, and the first information we have on nomadic beekeeping along the Nile, with the hives placed on large barges to follow the seasonal blooming of the plants, dates back to 3000 years before Christ. From the first dynasty of the pharaohs to the Roman period, the kings of Egypt were always associated with the bee symbol, and the corpses of the dead were treated with beeswax and propolis and immersed in honey, to ensure their long conservation. The Sumerians made beauty creams based on clay, water, honey and oil of lime, and the Babylonians feasted on flatbreads made with flour, sesame seeds, dates and honey. The Code of Hammurabi (1792-1750 BC) protected beekeepers by laying down severe punishments for those stealing honey from their hives. The Romans ate so much honey that they were forced to import huge quantities of it from Crete, Cyprus, Spain and Malta, whose original name,¬ Meilat, apparently means "land of honey". Not only was it the only sweetener known at the time, but it was also used to make mead (honey wine) and beer, as a food preservative and to make a wide range of sweet and sour sauces. In the course of history, the combination of wine and honey has always been greatly appreciated, and the practice of adding honey to wine continued up to Renaissance times. Today, wine is drunk without the addition of any sweeteners to the glass. The odours of honey are the result of the natural way in which the grapes are processed during harvesting and production. Honey is the result of the processing of nectar from flowers or other sugary saps sucked up by the worker bees during their long harvesting missions, which are then stored in the cells in the hive. It has been estimated that the bees visit around two million flowers to make a kilo of honey. As well as flowers, honey can also be made from the herbaceous stems of certain plants, and from the leaves of herbs and trees. 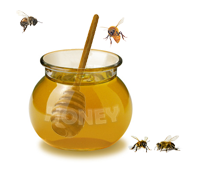 Honey is in fact of threefold origins - from leaves, stems and branches, and flowers. This latter is the true honey, while the first variety is known as honeydew and the second as manna. A kilo of honey provides around 3,250 calories, and its energy power is the same as that of three kilos of beef. The lovers of those wines known as moelleux in French know just how many nuances the aroma of honey can possess, marvellously interwoven with the floral notes of white petals, such as acacia and freesia, yellows such as broom and greens such as the lime tree. In these sweet white wines, with their soft, velvety texture, the aroma of honey demonstrates all its elegant attractions. The bouquets of the great French wines whose grapes have been affected by noble rot, such as Sauternes and Barsac in the Bordeaux region and Monbazillac in the south west, contain notes of honey in combination with the fruity strains of apricots, dried and candied and, at times, exotic fruits. This combination can in fact be found in all the botrytis wines and those made from concentrated, dried grapes. As a result of this fact, we know that honey is not a varietal or primary aroma deriving from the grape varieties used. The Semillon and Sauvignon Blanc used in some French wines are replaced by the noble Gewurztraminer variety in the great dessert wines of Alsace, where, even though it's transformed into an infinity of hues, the perfume of honey plays a leading role. In the zone between the Rhine and the Moselle, the Germans use the Riesling grape to produce their wines from late harvested grapes affected noble rot and their ice wines, or Eiswein, whose grapes are picked in January, strictly by hand, with obsessive attention to detail. The names may not be the easiest to pronounce (Beerenauslese, Trockenbeerenauslese), but the process is the same. The grapes wither and dry out, their flavour becomes more concentrated, as do the sugars and all the aromas, creating all the conditions necessary for a bouquet of incomparable finesse. In these wines, the aroma of honey is often concealed among the sweet, creamy notes of cinnamon and caramel, vanilla, dried apricots and orange peel. And this harmony remains the same if we taste the dessert wines of Austria, such as Ausbruch, or the legendary Hungarian Tokaji, made from grapes of the Furmint variety. In the Mediterranean land of Italy, the tradition of wine from late harvested grapes is just as strong. In the south, aromatic varieties such as Moscato d'Alessandria or Zibibbo and Malvasia produce bunches of grapes which are left to dry out in the sun, on straw mats or volcanic rocks. The result is such dessert wines as Moscato Passito di Pantelleria and Malvasia delle Lipari, with their brilliant, solar hues, and reflections ranging from deep gold to amber. When well made, these offer up a bouquet of extraordinary intensity and length, in which the aroma of honey is interwoven with orange blossom, candied citrus peel, figs, aromatic and balsamic herbs, and an interminable apricot ham finish. The many varieties of Vin Santi, ¬made with grapes harvested in October and left to dry out until Easter, contain notes of honey, and more specifically acacia honey. In Tuscany, this wine, made from the Trebbiano and Malvasia varieties, is more reminiscent of chestnut honey, followed by notes of dried fruit and quince. In Trentino, where it's known as Vino Santo, the wine is made from the Nosiola variety, and comes with walnut and hazelnut notes, along with candied fruit and fruit syrups. With its opulent aromas and interminable finish, Picolit from the Friuli region, which is a rarity even within Italy, contains a variety of honey notes, including acacia and others which defy classification, other than as generic mixed floral varieties, in perfect harmony with the scents of wildflowers, dates, dried apricots and stewed apples. We'll end this brief tour by pointing out that, as the honey aroma is a secondary fragrance deriving from the processes of vinification, it isn't limited to late harvested wines. At times, we can also find it in naturally sweet wines, especially those based on Muscat grapes. In some cases, it can be foundn in dry white wines, most frequently those made from Chardonnay and aged in small casks.